Alongside the new FE 28mm f/2, Sony released two conversion lenses that attach to the 28mm and turn the combination into a 21mm ultra-wide lens and a 16mm fisheye lens. 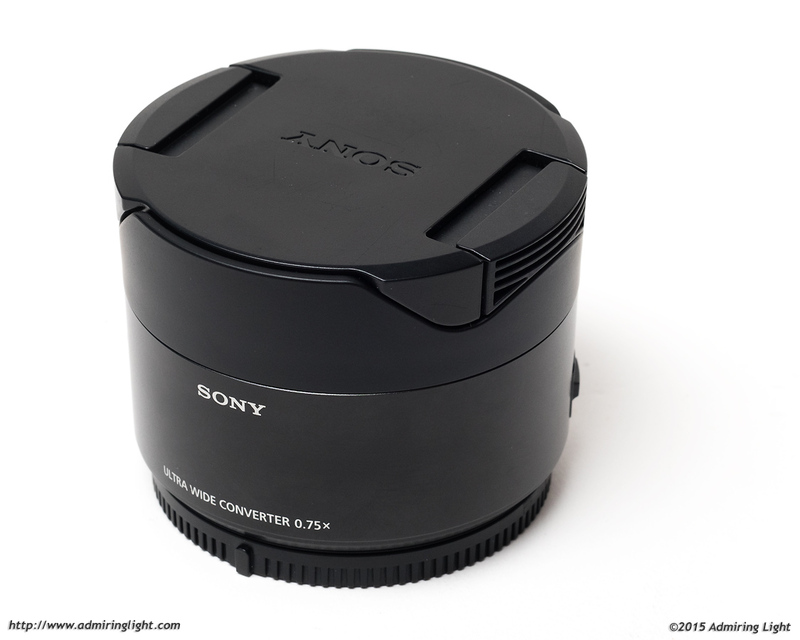 Today, I’m reviewing the 21mm ultra-wide conversion lens, otherwise known as the SEL075UWC. The 21mm conversion lens attaches to the front of the FE 28mm and creates a 21mm f/2.8 lens combination with full autofocus and autoaperture. 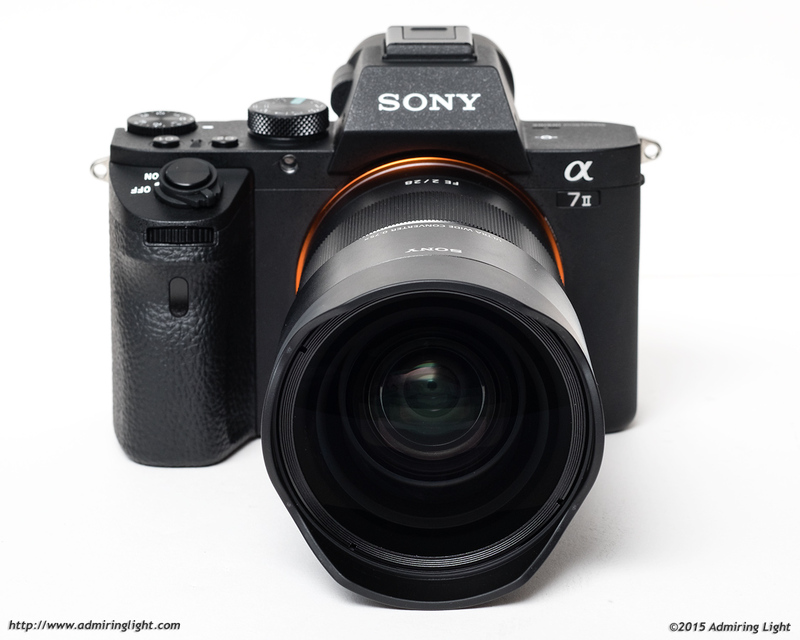 EXIF data is passed along as well, so the in-body image stabilization of the A7 II and new A7R II will automatically work at the correct focal length. The 21mm conversion lens retails for $249, so it’s an inexpensive way to gain an autofocus ultra-wide for your full-frame E-Mount camera. Sometimes these add-on lenses are more hype than real imaging solution, so I was very interested to see which of these things is true of the 21mm lens. One thing before we start: If you haven’t seen my review of the FE 28mm f/2, make sure you check that out as well. Ok, to get one thing out of the way, writing “21mm Ultra-Wide Conversion Lens” is something that I don’t feel the need to do throughout this article. Likewise, I’ve never been fond of referring to Sony lenses by their stock number. So, at many points throughout the review, I’ll refer to the 28mm f/2 + 21mm UWA conversion lens as the “FE 21mm f/2.8.” There are two reasons for this. First, it’s a lot easier. 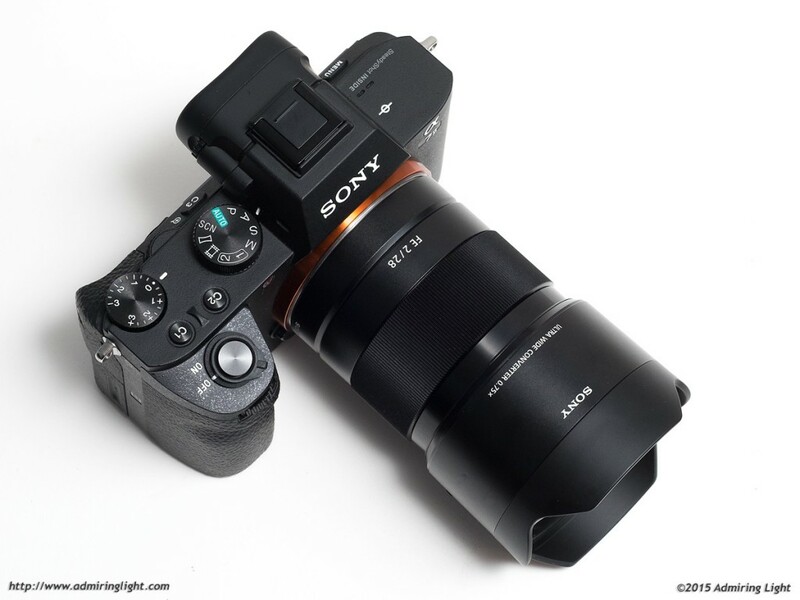 Second, it’s the nomenclature that Sony uses in the EXIF data when the conversion lens is mounted. If it’s good enough for Sony, it’s good enough for this review. The conversion lens is a simply plastic and glass lens with no moving parts and no electronics. The lens attaches to the FE 28mm f/2 via the hood bayonet mount, and it locks securely into place. A magnet sensor in the conversion lens tells the FE 28mm that it is mounted, and all camera information then views the lens as the FE 21mm f/2.8. The conversion lens is simple and sturdily built, but the connection feels a bit too flimsy to me. This doesn’t mean it wobbles excessively or anything, but rather I don’t know how much I would trust the lens to a solid knock near the front, and I don’t know how well that slim connector will hold up to repeated use. I would have preferred the bayonet on both pieces to be metal and a bit larger and more robust. The FE 21mm f/2.8 combo turns the compact FE 28mm f/2 into a rather long and moderately heavy lens. I found the lens to handle well when shooting, though the process of detaching the UWA converter from the 28mm and putting it away, especially with the more difficult to attach rear cap, was less convenient than switching between two dedicated lenses, though the space saved in the bag vs. two different lenses is a nice bonus. The FE 21mm has a unique lens cap that fits inside the fixed lens hood to seal the whole front of the lens. The cap is well designed and clicks securely in place. The reason for the oddly designed cap, is that the FE 21mm lacks any filter threads, so using a polarizer or neutral density filter is impossible without rigging up some ad-hoc square filter holder. The FE 21mm f/2.8 focuses effectively as fast as the bare FE 28mm f/2 lens, which was a nice surprise. Despite the one stop slower aperture, there was no apparent difference to me in how the lens focused, both in speed and in accuracy. As the FE 28mm can struggle somewhat in dimmer light or backlit scenarios, so too can the combination with the UWA converter. Great review as always. I just bought this addon lens and can’t wait to review it myself. I wonder if in the long run the 16-35 would be the better option, however. Thanks for the review. It strikes me that the cost of the adapter is about as much as a few of the old MF glass options around this (21mm adapted) focal length- eg canon Fd 19 or 20 or Olympus 21 etc. For landscape use on an A7II from what you have seen, (keeping in mind that shooting stop would be at least an 8) How does the IQ compare? I have been using an fd 24mm it is very sharp copy and was very economical. (My Fd 28 is not!) It has been hard to justify getting something else modern so far as i keep testing at the local camera store and nothing has been sharper or that much superior to justify cost. I really liked the Sony 28, but what I need is wider! Enter the adapter. what’s your take? Cheers! I wonder if there is a way to use this with another lens. Can you post the back of the lens? are there moving parts in it? I know this is an apple vs orange comparison, but which one will come up on top in terms of optics, IQ, sharpness etc? FE28 + 21mm adapter or Fuji XF14mm? The Fuji by a mile. Not that the 21 isn’t a good combo, but the Fuji is an exceptional lens. Sharp to the very corners, no distortion, etc. Any thoughts on how it compares to the ~19-21mm legacy primes at a similar price point? I’m thinking of the Nikon 20mm f/2.8 AI and D, Canon FD 20mm f2/.8, Minolta Rokkor-X 20mm f/2.8, Voigtlaender 20mm f/3.5, Olympus 21mm f/3.5, and Pentax 20mm f/4, all of which are ~$200-350. Probably some others I’m forgetting as well. I had been planning on getting the UWA converter, based on my good experience with the SEL16F28 + VCL-ECU1 on the NEX. The SEL16F28 wasn’t a great lens, but the VCL-ECU1 did a great job, was cheap ($100), and seemed to increase IQ rather than degrade it. Then I realized that the Nikon 20mm f/2.8 that a friend was selling weighed the same as the UWA converter. If it can perform any better than the FE 21mm, it might make more sense for me. Thanks for a great review, as usual. thank you for your great review … i just ordert the combo to have a closer look. Pingback: ????????????? ?FE 28mm F2 ?????????????????? | ????????????? Pingback: ?? ?FE 28mm F2+SEL075UWC??????????????????????? | ???????????? ?